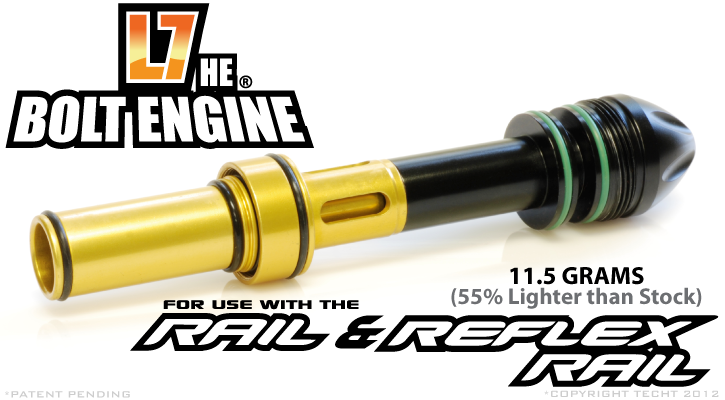 TechT Bolt Upgrades | Proto Rail 2011 and Up/ Reflex L7 H.E. The L7 H.E. Bolt System for the Proto Reflex Rail 2011 and UP takes accuracy, speed, and efficiency to a whole new level. The idea behind the L7 Bolt System is to reduce the moving mass inside of the marker to the bare minimum. Lightening the bolt means that the marker will naturally have less kick/recoil as the bolt moves back and forth. This, in turn, allows you to stay on target better and shoot more of your opponents. Our New L7 H.E. 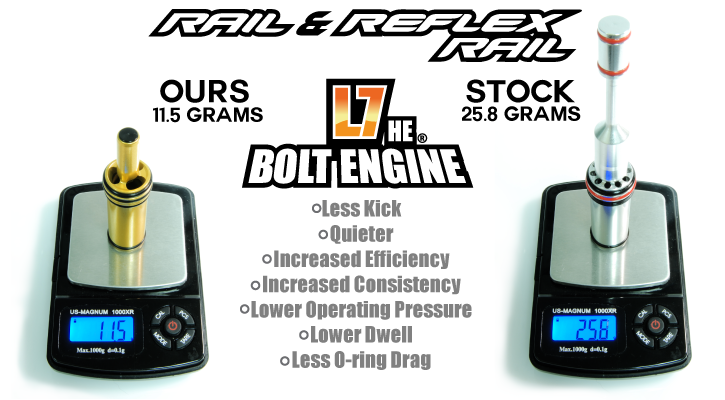 Bolt for the Reflex and Proto Rail utilizes a newly redesigned stem that produce a more efficient, consistent cycle. The L7 H.E. Bolt uses a newly redeisgned plug to improve consistency. It also features a new stem which delivers the maximum amout of efficiency with each pull of the trigger. This modified tail and plug combination produce one of paintballs most amazing aftermarket upgrades ever created. During our testing of the L7 H.E. Reflex Bolt we at TECHT were able to operate the gun at a pressure between 110 psi -125psi shooting at 285 FPS. 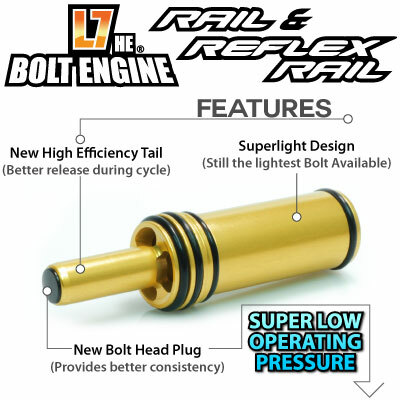 The lightened bolt also allows for lower pressure and dwell settings, as well as eliminates FSDO (First Shot Drop Off) commonly associated with spool valve markers such as the DYE and Proto markers. The TECHT L7 H.E. Bolt for the Reflex and Late model PMR Markers will give users the smoothest shooting, most consistent, fastest cycling, gun theyhave ever laid their hands on! This bolt works on the 2011 Proto Rail or the Proto Reflex. Three time rebuild for the L7 H.E. PMR Reflex bolt system. One time rebuild for the PMR L7 bolt system. This will work on all PMR's.